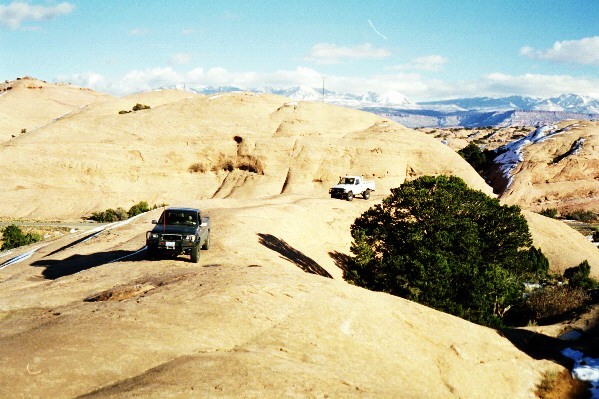 Six months since Cruise Moab 2000, the seasons had changed, and so had the trails. Nature gives a different obstacle to surmount, and a different line. But the constant remains: men and machines against all the challenges that nature hurls in their path. On this trip, nature would test and prevail for a time, then the men and their machines overcame the adversity and triumphed over the hard sandstone and icy rocks. 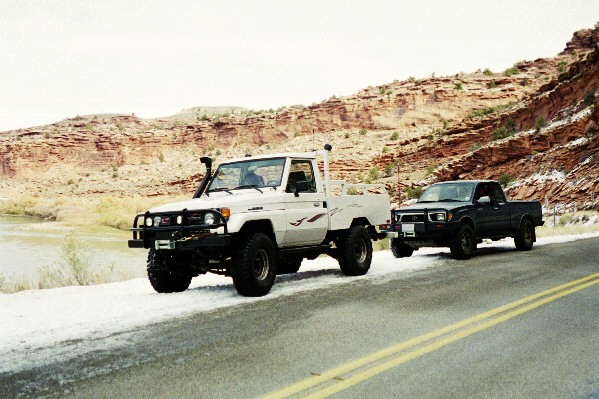 Rising Sun Four Wheel Drive Club hosts Cruise Moab every year for hundreds of Land Cruiser and Toyota 4x4 enthusiasts each year, and contributing to the success in any difficult undertaking is good preparation. Trail leaders and tail gunners are counted on to ensure the safety and enjoyment of the event participants and must practice and prepare, as any good team does. Part of this preparation involves actually running the trails during the off season, to learn each turn and line over each obstacle. Part also involves learning to deal with the unexpected, and how to better prepare to cope with it next time something goes wrong. The weekend before Thanksgiving was set for the year’s first prerun, and the participants emailed details as the time grew near. 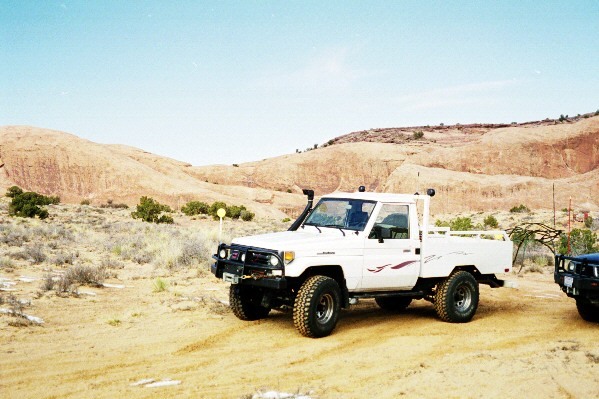 There would be 6 rigs; 3 Land Cruisers, 2 Tacos and a Runner. Greg "Cheeseman" Luer, Rising Sun and Moab veteran would lead the group. 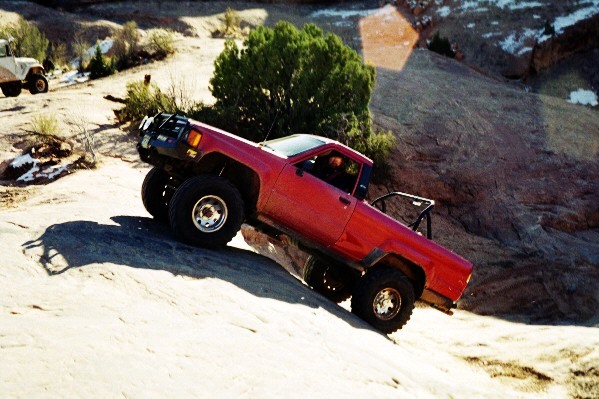 His ‘85 Runner was locked and lifted and had seen every trail at Moab at least once, many several times. Moreover, a veteran of man and machine versus nature, he carried an array of spares, tools and mechanical knowledge which would become invaluable during the trip. 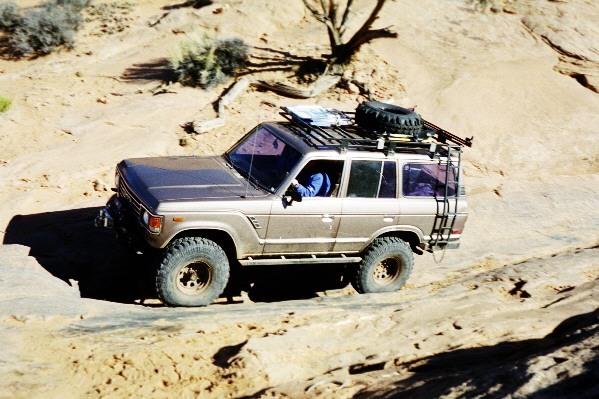 Bruce and Barb Miller trailered their Mark Whatley-built, sprung over 1985 FJ60 "Three Dog", a masterpiece and testament to what a skilled and experienced Cruiser guru can dream up. Bruce Westlund and his daughter Chrissy were in "Jethro", Bruce’s sprung over 1968 FJ40, donor of many parts to my 1971 FJ40. 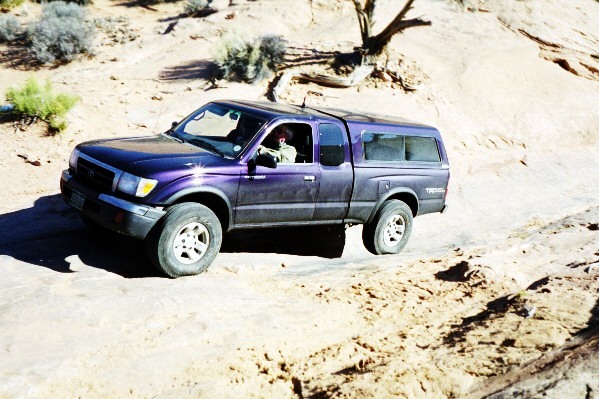 Chris and Mary Mcleod drove their 1999 bone-stock Taco, who’s bumper had been rearranged a couple times on recent Rising Sun events, and Matt Lewis drove his steel-enhanced 1995 Taco. Cheeseman, 3 Dog and Jethro were set to arrive Thursday evening and head out for a morning trail run first thing Friday, while Matt and I would caravan together for the long highway trip at daybreak that day and arrive there in the early afternoon to join in a short trail run. The Mcleods were set to arrive later that evening, well after dark. We were to meet for the afternoon trail run at Lion’s Back between 1:00 and 2:00 PM. 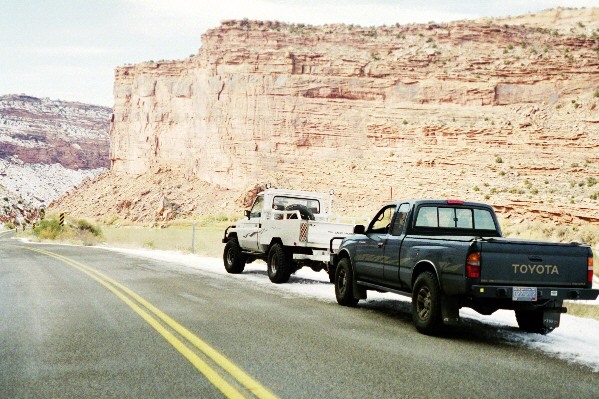 The original fear was that we might not make it there by the 2:00 PM cutoff, but due to a good early start and minimal traffic over the mountain passes, we pulled into the town of Moab by 12:30, with enough time to check into the hotel and then head out to Lion’s Back by 1:00. When 2:00, and then 3:00 came and went, and radio calls were met with crackle but no reply, more time passed, we realized that something must have come up, so we decided to try to make the most of the situation while there was still some daylight. Using Matt’s Moab trail book, and my memories from 6 months prior, we came to the first trailhead, Mini Lion’s Back. After a 7 hour drive on pavement, then milling around waiting for the rest of the group, it was exciting to finally air down and lock in. 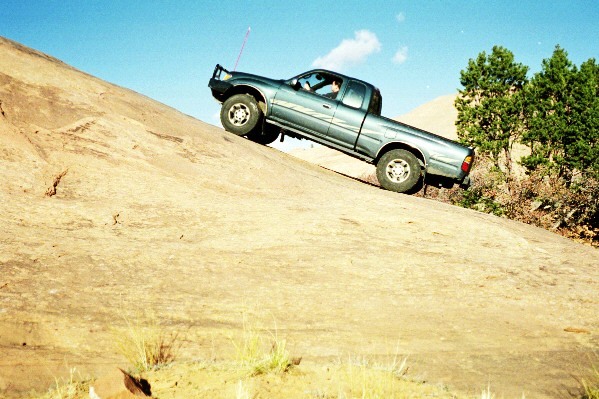 Mini Lion’s Back is a brief encapsulation of the classic Moab slickrock experience: sandstone sloping straight up from the desert floor, then ride the rocky spine of a giant boulder, straight back down to the desert sand and enjoy the adrenaline rush. We then decided to set out on Fins & Things, as the trailhead was only a short distance away. After finding the trailhead, under my inept leadership we abruptly became completely lost in the boulders and sand washes. "This doesn’t look familiar" I kept saying, and I was right. Fortunately, it was easy to see where we had come from, and clambered our way back there. Only then we noticed where the painted stegosaurus’ were on the rocks east of us. As soon as we started up that boulder, the familiarity came back and the trail was easier to follow. Lesson in leadership: "Learn the trail dummy!" As the sun slipped lower and lower, we completed the southern loop and Matt’s voice came over the radio "Well we have maybe 1/2 hour of light left, do you think we should go on or head back to the road?". I answered back that it was best to get off the trail, no sense pushing our luck too far. 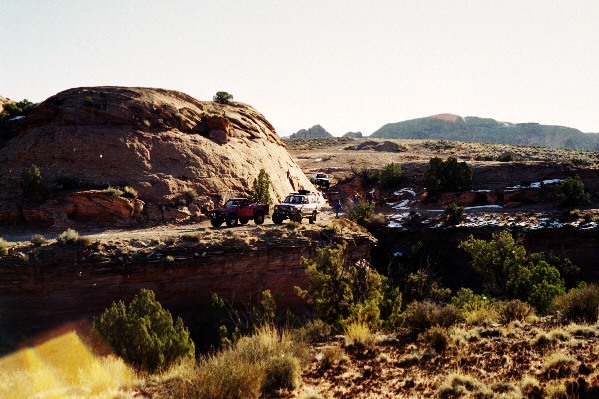 Returning to the town of Moab, we headed north to Slickrock Campground, and met up with the Millers. Seems 3 Dog had suffered a broken birfield on Hell’s Revenge, and the subsequent trailside repair didn’t go as smoothly as one would have liked. Greg had a spare birf, and between the group there were plenty of tools, but when the birf grenaded it scored the housing and shaft and they had to be filed down by hand to make everything fit back together properly. As such, they didn’t make it off the trail until long after Matt and I had left Lion’s Back. 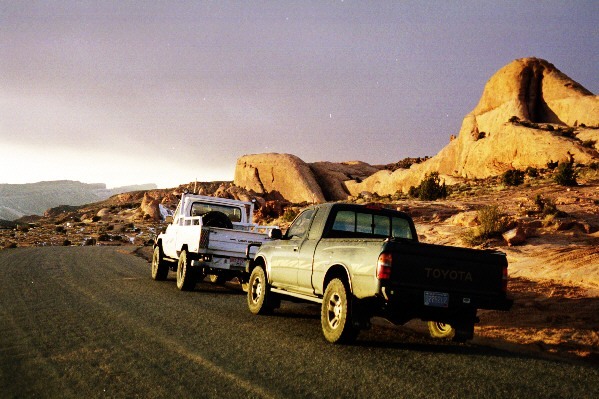 Jethro and Cheeseman returned to Slickrock, and plans were made for dinner. 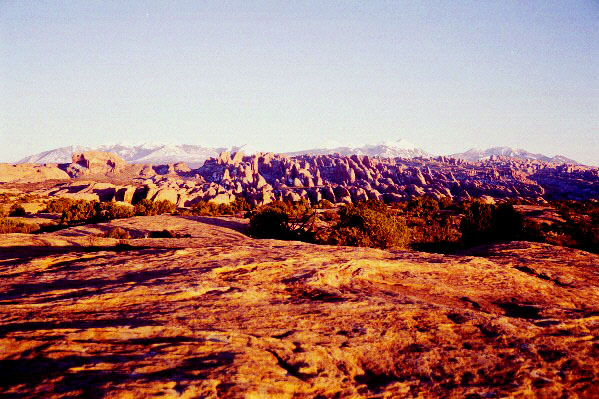 At first light, we met at Slickrock and quickly set out to the trailhead. 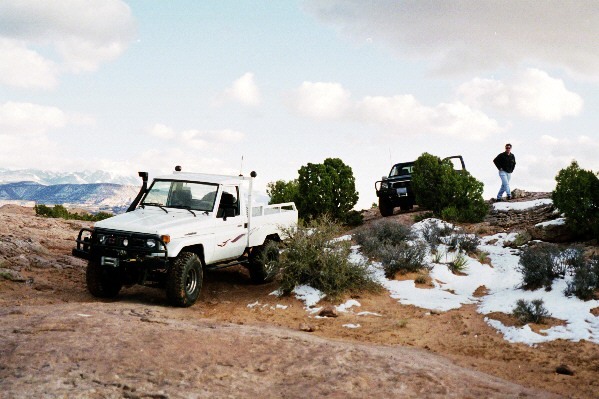 The forecast snow showers didn’t materialize and bright early morning sunshine greeted the Toyotas and their anxious pilots. 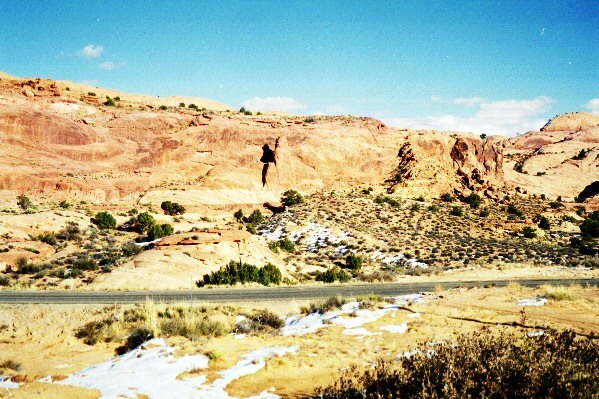 Airing down next to the scenic Colorado River, the deep red cliffs and surreal landscape was reminiscent of the backdrop for the "Roadrunner & Coyote" cartoons. Instead of the roadrunner’s "meep meep", all that could be heard was the sigh of the breeze along the rocky crags. Above, eagles caught the thermals and spiraled up in search of prey. It looked to be a good day for wheeling. But looks can be deceiving. After shifting into 4WD low we made our way up the rocky ledges. Jethro and I had already passed a sharp switchback when we realized we had inadvertently taken the bypass to the trail’s first obstacle, and Cheeseman was spotting Matt and his Taco down the steep cutting. Next was Chris and Mary in their purple Taco and we were off again. The first serious challenge on Poison Spider Mesa is called the waterfall. Purpose built rock crawlers have their choice of interesting lines up the rock face. But stockers have about one choice to have a reasonable chance of success. After trail leader Cheeseman showed the proximally best route, we each followed. There was a number of short but steep ledges that followed, during one, a loud boom of breaking metal was heard and a heavy thud through the frame of the cruiser could be felt, yet still the tires chirped their way up over the sandstone ledges. Soon we were getting toward the top of the mesa and the surrounding cliffs and valleys could be seen clearly. The sun rode higher as men and their machines resolutely climbed the trail. Soon, the group came to the fork in the trail where Golden Spike starts. Much is made of that trail, but continuing Poison Spider we soon come to Wedgie. Wedgie is a V-shaped cutting in the rock that if done properly, is a walk in the park. Even though the sides are at a 45° angle, aired down tires can stick to the red sandstone like velcro. After Cheeseman came through, Jethro started up with Cheeseman’s excellent spotting. 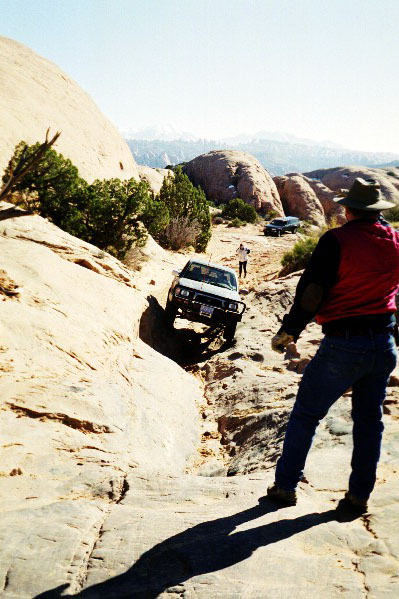 Unfortunately, Jethro was not equipped with power steering, and one slight turn ended up with Jethro completely against the jagged sandstone. 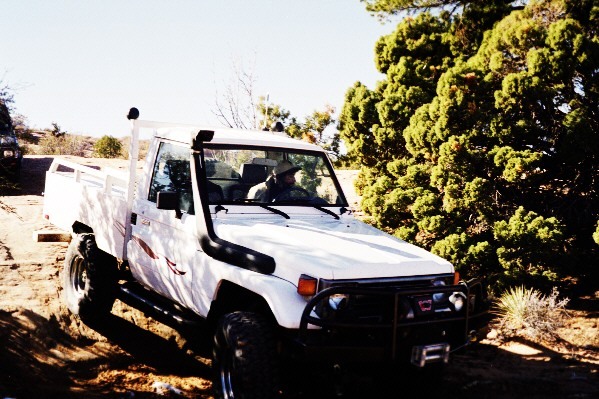 Jethro is a capable FJ40, locked front and rear, sprung over with 35x12.5 mud terrains. But without power steering, the rear corner slipped right down to the bottom of wedgie and the right rear tire was jammed against the sandpaper like rock all the way around. The left front tire was several feet in the air, and the right front was barely touching anything as the 2F groaned and the cruiser shuddered. 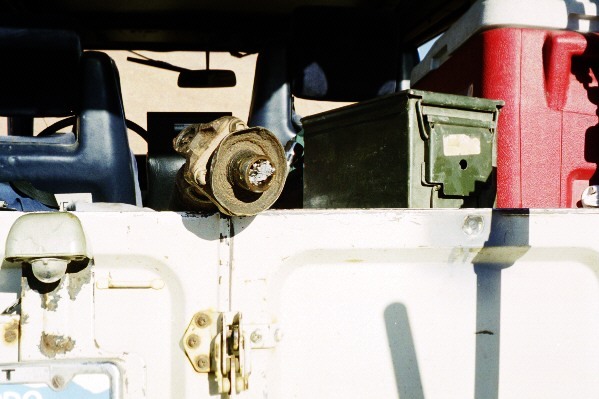 It took considerable torque to get the front back down and rock the cruiser onto at least 3 tires. 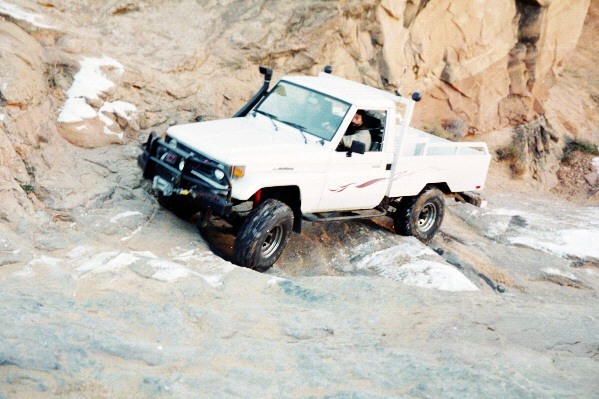 Next up was 3 dog, the Miller’s locked and sprung over FJ60, trundling carefully through the rocks. Matt followed in his Taco and then the Mcleods and their Taco. I wimped out by taking the bypass, but it turned out to be a wise decision. Somehow I just knew it would have been a bad idea. That metallic boom just reverberated in my mind. Several more rock ledges later, we came to an unnamed obstacle that seemed another typical Moab rock ledge coming up from a sandy launching pad. Jethro was in front of me and seemed to struggle a little at first. 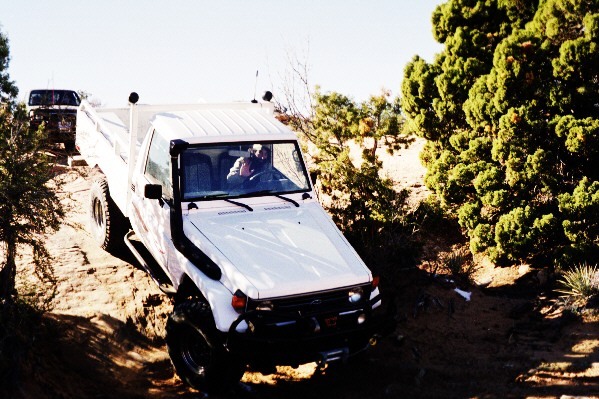 Then I heard another metallic boom and saw Jethro’s rear driveshaft flailing around against the snowy sand. I radioed: "Jethro, I think you have a broken driveshaft". He replied "I know, I know". 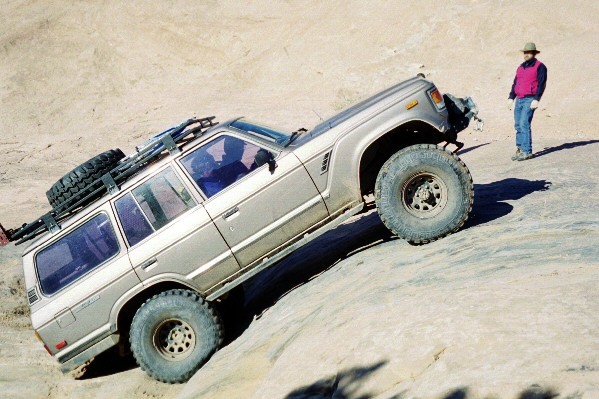 Bruce had been christened "Pinion Boy" at Cruise Moab 1999, when he broke two pinions in as many days. 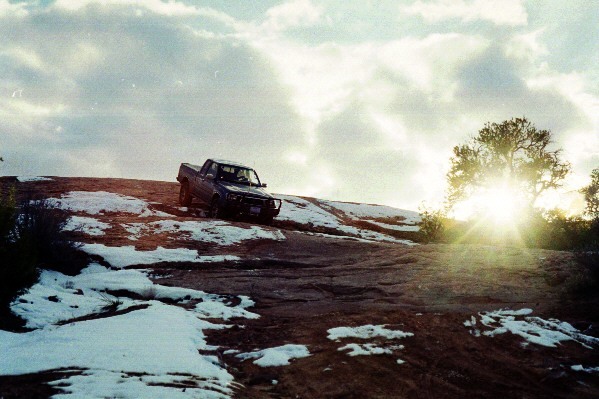 Made Toyota Trails on that one. Mark Whatley participated in one of the repairs. He got a traction bar after that and hadn’t had any pinion woes up to this time. Afterwards I asked a buddy about the pinion problems and he said "it’s a spring-over thing". Since the remnants of the pinion were binding up inside the ring gear, it was an ordeal just to unblock the trail. After we got him back up enough that the other rigs could get past, we had a pow wow. Rising Sun never leaves anyone alone out on the trail. 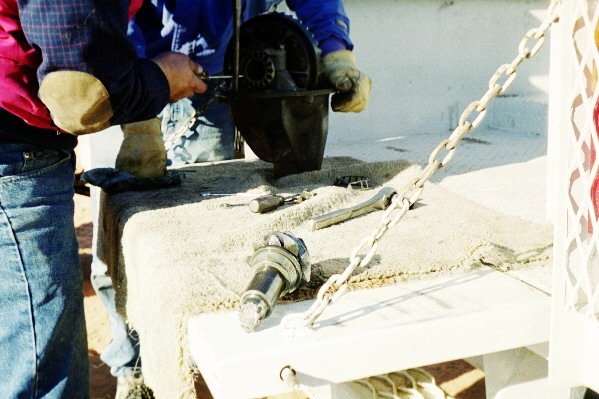 We knew that we had to get the busted pinion freed up to get the rig to move. But only so many fingers can fit inside a diff at one time. So 3 Dog stayed with Jethro, and the rest of us continued the trail, which loops around on top of the mesa and would return us to Jethro’s location. We got to the top of the Mesa, and the views were spectacular. Even though there were intermittent high clouds, the sun finally started warming things up and casting more contrast on the canyon walls. 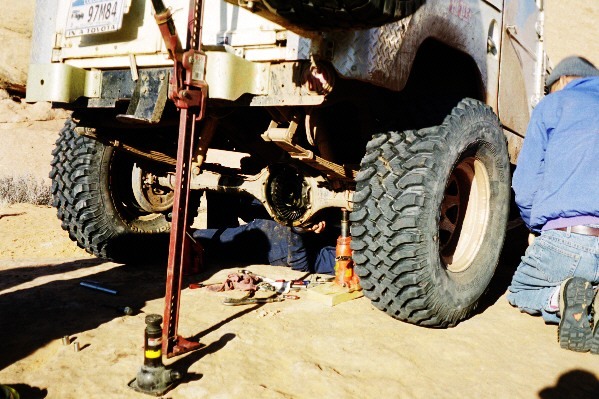 We stayed within radio contact with the crew working on Jethro’s diff as we wound along the rocks, sand and snow. 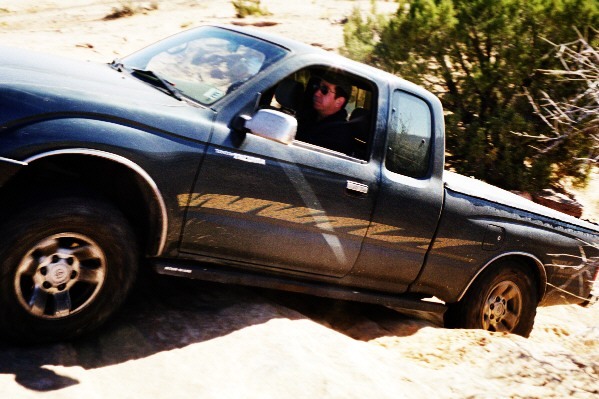 At one point we came to a deep sand wash. On a hunch, I took it out of four wheel drive and did some donuts. Even with the lockrite, the left rear tire was not spinning out at all, not a good sign. We came to the last climb up to the top before the small arch that overlooks the Colorado river and it was typical Moab: Straight up the sandstone, all you can see is the blue sky over your hood and you hope there’s more rock than cliff. 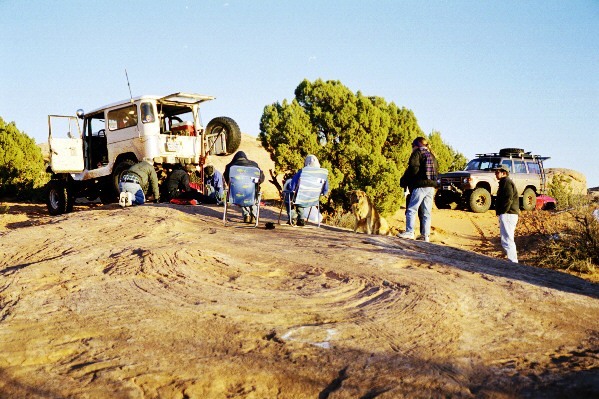 When the four Toyotas came to the top we parked and broke out lunch. Walking down the rocks, we were able to peer over the cliff above the river and see Moab Rim trail, a short but challenging section where a false move could mean sliding and tumbling a thousand feet to the canyon floor. Meep meep. Back on top, I broke out a jack and lifted the left rear tire just off the rock. It spun freely. Broken axle. Thought so. Hmmm. Glad I didn’t try Wedgie, prescription for body damage. Now that I know I only have 3 wheel drive the decision is quickly made to return, and Gold Bar Rim will have to wait for another day. 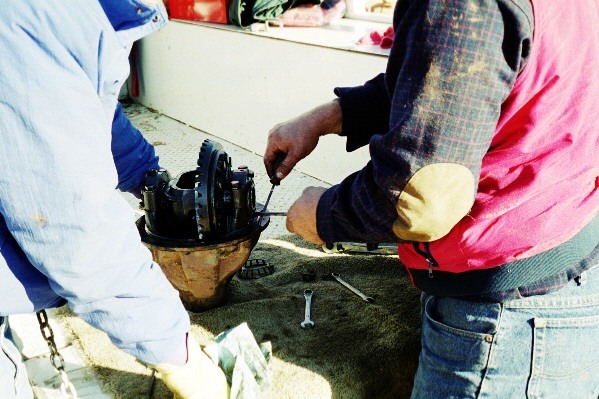 We head back and soon arrive to the site of the field repairs to Jethro’s pinion. 3 Dog had managed to help get Jethro back onto reasonably level sandstone and the rear end was jacked up, inspection cover and driveshaft off. The lockrite was being dismantled and small parts put into a coffee cup. After pulling the 3rd member we were able to get the shattered pinion removed and reassemble the 3rd member. The sun sunk lower towards the horizon and the shadows grew longer. The temperature dropped and the repairs went on. Crows circled, as if birds of carrion expected their bellies full soon. After the lockrite was partially reassembled, one of the C clips fell part way out, and the whole thing had to be removed and put back together again. It’s amazing what you can do with a butterknife and duct tape. After the inspection cover was bolted back on and 90wt refilled, the arduous task of getting back down the trail began. By now the sun had set and darkness was growing deeper. The chill came over and the ice recrystallized. There was no question about bypassing the remaining obstacles wherever possible. 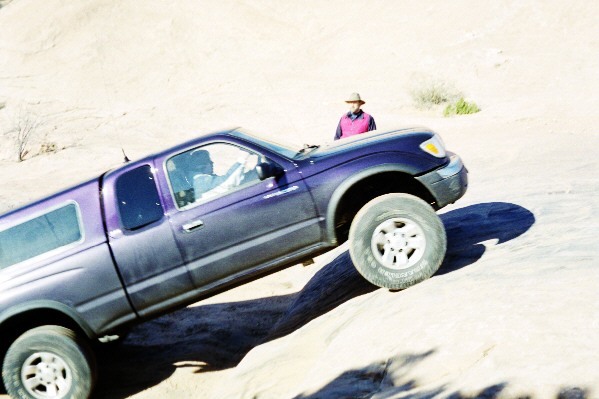 But even though we were headed generally down, many rocks required steep uphill maneuvers and Jethro only had front wheel drive, and I only had 3 wheel drive. 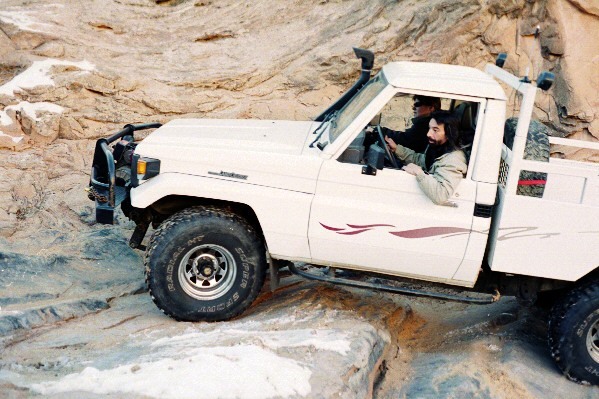 The bypass for wedgie required a strap for Jethro, but other than that Bruce was able to pilot his FJ40 in front wheel drive over some pretty tough terrain. At the waterfall, Barb jumped out of 3 Dog and gave excellent spotting in the dark, much like the ground crew bring in jets to the jetway. She had to stare into the headlights as we scraped and bumped down the rocks but she kept us from falling into recovery situations. 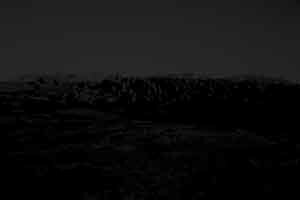 The switchbacks proved especially challenging in the dark. Headlights, even off-road auxiliary lights seldom illuminate much more than 45° to the immediate side of you, yet these were much more than right angle turns. Too wide a line and you will be off the cliff. I finally remembered my half million candlepower handheld searchlight and used it to help spot those switchbacks. 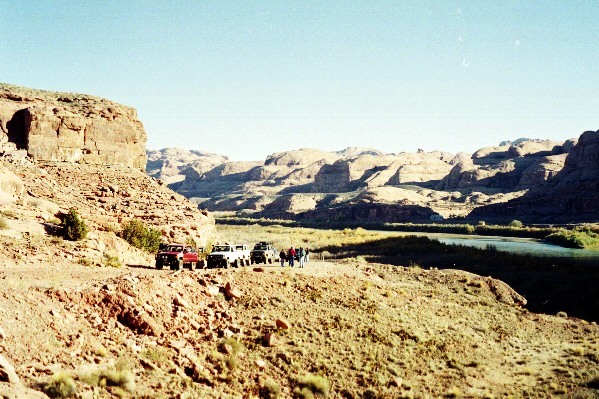 There was quite a relief at finally reaching the trail head and cruising back into Moab. 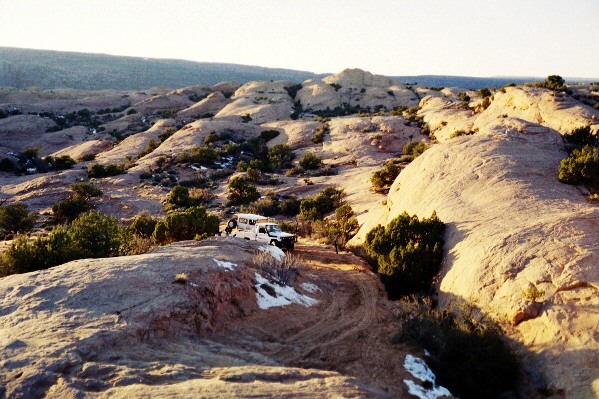 At Slickrock Campground, 3 Dog and Jethro are driven up onto the trailer, and then we all headed out to dinner to swap war stories and laugh about the day’s events. A broken birfield, pinion and axle, yet everyone made it out safe under their own power. Man and machine versus nature. 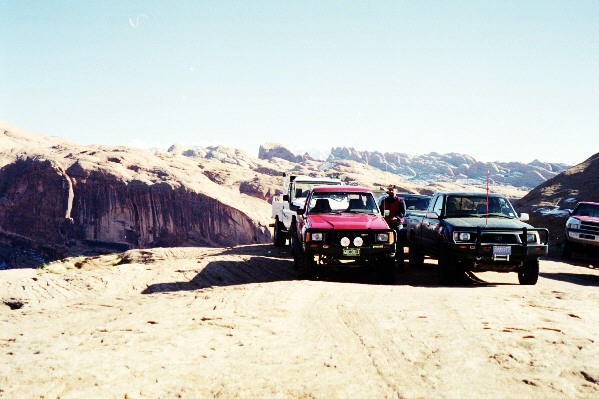 Land Cruisers and Moab. What a combination!